When the housework calls and the cleaning fairy hasn't arrived, instead of plonking the Mini Mes in front of the TV for another episode of Good Luck Charlie I like to provide them with a simple activity to complete. A recipe or craft. 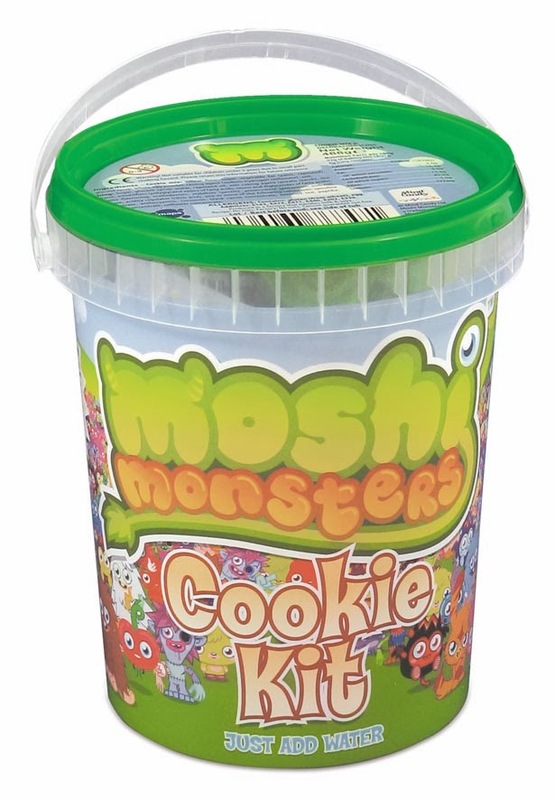 We received a Moshi Monster kit in the post and with only water required to make a batch of delicious cookies I could ensure they were kept entertained while I was kept busy - perfect. The instructions were very easy to follow and they even tell your child to wash their hands before they begin which I think is a great reminder for when kids are baking unaided. It also tells children to seek help from an adult when using the oven - they really have thought of health and safety first when constructing this kit, which as a parent was reassuring. The Mini Mes had no issues reading the booklet, creating the mix and cutting out each cookie by themselves. It gave them a bit of independence and built their baking confidence despite regularly cooking with me. Once baked and cooled the decorating tubes encourage further creativity and the tub the kit comes in can be used to store the cookies within to keep them fresh. Minxy in particular loved this part and spent some time using a combination of the icing supplied and our own sprinkles. Athough the Mini Mes dusted the worktop with flour to roll the mixture out as instructed, unfortunately they used self raising which meant some of the biscuits expanded a little while in the oven and lost their Moshi Monster shape... oops! They did however taste really nice and I would purchase these in the future to make when their friends visit or to take away on one of our weekend breaks. There are 6 cutters available to collect in total which of course can be used again when baking on other occasions too - very handy. The fun doesn't stop there as each kit contains a code to use on the Moshi Monsters website too! Each kit from Maps Toys is £5.99 and makes around 24 cookies. What do your children love to bake? That looks like it's fantastic fun!! That's a great kit, really well thought out and the instructions sound good. I think it might make a fab little birthday present too. I do enjoy baking with the kids - the cookie cutters look really effective. Looks like a great kit, well thought out :- Popular, Practical and Safety Conscious. The kids love Moshi Monsters. Thanks for the review.